Vidya Bhawan Rural Institute is located at Badgaon, near the city of lakes Udaipur in southern Rajasthan. The College is situated in 60 acres of green, clean and serene environment. 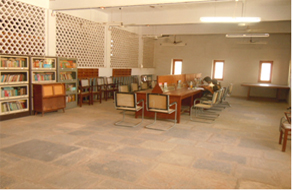 Vidya Bhawan Rural Institute provides hostel facility for boys within the campus. Hostel has accommodation for 60 students. Well furnished spacious rooms have all amenities; including 24x7 power and water supply, television, water purifier and kits for indoor and outdoor games. Canteen is nearby! The building surrounds a playground for hostlers. First aid facility is available for any eventuality and a hospital is in close proximity. The academic area has natural surroundings and is always bustling with scholastic and co-curricular activities. Spacious, well lit and airy classrooms provide a comfortable study environment. The faculty creates conducive atmosphere for dynamic and focused discussions. The College has a well stocked library with networked computers. A rich collection of more than 44 thousand books cover diverse spheres of social sciences and humanities, science, commerce and management. A range of encyclopedias, research journals, magazines and newspapers are also available to students and faculty members. A special reading room is located on the 1st floor of the library for students and scholars who wish to have their space to engage in rigorous academics. The Book Bank facility is available for all students. Presently, the students avail benefit of 8518 text-books in the Book Bank. Each student can take a maximum of 6 text-books for the entire academic year by paying 20% of the printed price of the book. Sr. No. Particulars Categories Nos. Please click on the link below to see the new arrivals in the library of Vidya Bhawan Rural Institute in the year 2014-15. The College has separate laboratories for Physics, Chemistry, Botany, Zoology, Computer Science and Geography. All laboratories are well equipped to meet the requirements of teaching and learning as per the syllabus. The College has a digital Language Lab to develop the communication skills of the students. 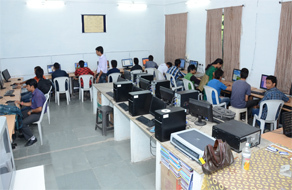 Two fully furnished Computer Science Labs have 60 computers with peripherals like Hi-DPI scanners, printers and projectors. The College has internet with Wi-Fi facility. Six well equipped Chemistry Labs have instruments like UV/Vis spectro photometer, polarograph, karl fisher and flame photometer apart from regular features..
Two Botany Laboratories have numerous specimens and provide all the necessary facilities to understand and learn about the vivid flora. Microscopes and other equipment bring to fore the story of life in the Zoology Lab, which has turned digital too. The dissections will be done digitally. Charts, maps, models, wooden based light-globe, survey instruments, GPS, telescope and ‘The Times’ world atlas are part of the extensive learning materials available at the Geography Lab. VBRI has indoor and outdoor games facilities. Two playgrounds are used for Football, Hockey, Kho-Kho, Cricket and various track and field events. Kabaddi and Volleyball are played on separate courts. The College hosts tournaments and sporting events. Inter-College Weight-lifting, Power-lifting and Best Physique Tournament was organized in 2012. In the same year, VBRI won the Inter–college Volleyball Championship. The College has canteen facility for the students and staff. Spacious and hygienic, the canteen accommodates 40 people at a time. VBRI has over three dozen residential quarters available for teaching staff and class-IV staff. The quarters are situated in a natural and serene atmosphere. The College has established a separate Common Room for girls. The room has been designed to give female students a comfortable place to unwind, study and have informal discussions. The room is well lit and ventilated; and has a relaxed friendly ambiance.